to the writers and bloggers who donated their time and talent via recipes and images that together made a cookbook, and to Cathryn Ironside, who spent countless hours turning that copy into something we could all keep on our kitchen shelves and use to feed our families and friends. What wonderful evidence of what good can come from a single thought, when so many generous people work together to bring an idea to fruition. I'm so proud of and grateful to everyone involved, and so thankful to all who purchased a copy. Truly - my deepest thanks. Please do continue to support the efforts of the Red Cross and Doctors without Borders as they continue their relief efforts in Haiti. I'm just blown away by everyone's generosity. Thanks to all who have ordered! We've decided to wrap up this project tomorrow - Friday February 12th - to coincide with the Canadian government's program to match donations to aid organizations working in Haiti. So if you don't have your copy, you have a little over 24 hours to order one. Or two. Or ten. You can order your copy here. Thank you. I'll keep you all posted over the next 24 hours! Over 600 books already sold! 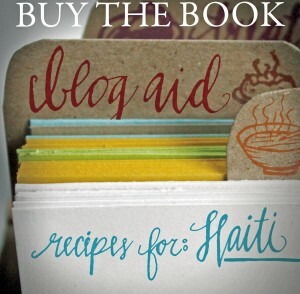 Twenty-seven food bloggers from around the world have quickly acted on the need for food and aid in Haiti following the January 12th earthquake by compiling a cookbook. Quite possibly the fastest concept-to-publication book in history (the idea came January 14th; the full-colour cookbook, including photographs of each recipe, was completed February 3rd), all proceeds from book sales will support Haitian relief via the Red Cross and Doctors without Borders. On the day of its release, the cookbook raised over $10,000; the Canadian Government will double those dollars, as well as any others raised, until February 12th. Each writer, chef and blogger contributed their own recipes and accompanying photos; contributors ranged from a 16 year old high school student with celiac to Chef Michael Smith, best known as Chef at Home and Chef Abroad on Food Network Canada, who was quick to jump on board, despite being busy at athlete’s village as the executive chef for the upcoming Olympics. George Brookman, past president of the Calgary Stampede and CEO of West Canadian Graphics in Calgary, enthusiastically rallied his team to make arrangements for a new print-on-demand system that allows buyers to purchase the book online and have it printed and shipped in real time, eliminating the need to rely on the more time-costly traditional large-run printing route. Printing partners West Canadian Graphics and Blurb.com in San Francisco were instrumental in supporting the efforts of the designers, artists and contributors as they brought the book to life. Graphic designer Cathryn Ironside spent hundreds of hours on the layout and design; the book is 7”x7”, 110 pages and full colour with a soft-cover ($25) as well as a hard-cover ($50) option. It's done. It's done. It's totally done. It's really, fully done. The combing and the fawning and the spell-checking and the Cheezie-eating and the cross-eyed-going dragged on for an extra day or so, but we managed to upload it at approximately 4:53 pm (which, it eerily turns out, was the exact time of the earthquake on January 12th) and finally LET IT GO. At which point it came back, with file issues... we went across the street for spaghetti and meatballs and then came back to hack away at the pdf and replace some images that weren't cutting the mustard. What was supposed to be a brief touching up this morning followed by a triumphant upload by noon stretched out to a 14 hour marathon (can't believe it? neither can we), at which point we REALLY AND TRULY FINALLY got it gone, and then the ordering system set up. Before midnight, even. Barely. And now commences the press release-sending, hand-wringing and order-status-checking. What now? I'm going to Disneyland! Not really. Maybe Swiss Chalet. There's still a glitch in the system - my overtired self can't quite determine how to get both the hardcover and softcover version onto one ordering page - right now they are on two pages - but I couldn't wait any longer and it leaked out on Twitter soon after midnight, so here I am, offering up the goods. You can order the book, and preview it - the hardcover version ($50) is here, and the softcover version ($25) is here. They are both the same book, save for the cover - 7"x7" and 110 full-colour pages, with photos of each and every recipe. I'm hoping that with the light of day, when my mental capacities return somewhat, I can figure out (or have someone tell me) if/how to put both versions on one ordering page. But yes - we squeaked in under three weeks - from concept to completion - and there were so many on board helping make that possible. Cathryn Ironside. Beth Snyder. George Brookman and the fine folks at West Canadian Graphics. Jim and the guys at Blurb.com (some of whom are apparently from Lonely Planet). And everyone who cheered us on, sent rah-rah emails, brought lasagna. I'm so proud of all who contributed to this pot of stone soup, so eagerly, generously, selflessly - even while tending to wee ones with a stomach bug or while pregnant and teaching band to dozens of young teenagers. One is at athlete's village, cooking like crazy in what he calls the biggest kitchen he's ever seen (and I imagine he's seen a lot), another is celebrating the launch of her first book, yet another is in high school. I love that this project has brought together such a diverse group of people with a common love of food. Hell, I'm going to bring them out again. Let's hear it for Chef Michael Smith, Dana McCauley, Emily Richards, Catharine from Weelicious, Cheryl from Backseat Gourmet, Jeannette of Everybody Likes Sandwiches, Nishta from Blue Jean Gourmet, Lauren of Celiac Teen, Charmian from Christie's Corner, Shaina from Food for my Family, Marisa of Food in Jars, Shauna and Danny from Gluten-Free Girl and the Chef, Lauren from Healthy Delicious, Alice from Savory Sweet Life, Tara from Seven Spoons, Jess of Sweet Amandine, Helen from Tartelette, Gail from The Pink Peppercorn, Pierre of Kitchen Scraps, Tim from Lottie and Doof, Tea from Tea & Cookies, Jamie from My Baking Addiction, Lori from Recipe Girl, Melissa from The Traveler's Lunchbox, Brooke of Tongue-n-Cheeky and Aimee of Under the High Chair. Yay team! 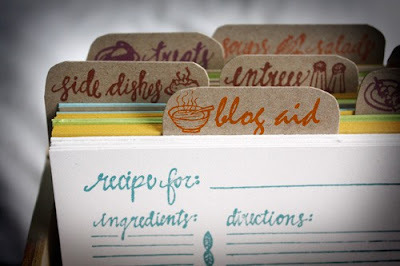 I'm excited to report that the Blog Aid cookbook is in its almost-final stages of completion! It has been a tremendous amount of work, mostly on the part of Cathryn, a wonderful friend and human being who has plodded away for much of last week and then night and day all this weekend (literally: yesterday she didn't leave the kitchen table of her cozy house in Sunnyside from 8am until 3am Sunday morning), dropping and organizing the copy and photos into a beautiful layout. Cathryn is one of the most generous, kind, giving people I know. She supports me in everything I do, if even by email because we don’t see nearly enough of each other. So here's the gist: We’ve partnered with two companies: West Canadian Graphics in Calgary and Blurb in San Francisco (it’s too bad technology allowed for productive conference calls and a one-on-one meeting wasn’t required in San Fran); both are overseeing the production of the book, which will actually be available for order online THIS WEEK. SOON. It's a POD (print-on-demand) system, meaning the file is uploaded and then books are printed and shipped as they're ordered, which means this is all happening in real time and books will arrive in about 8 days. (This could possibly be the fastest compilation cookbook project in history; under a month from conception to finished books!) The proceeds from book sales will go straight to Haitian relief via the Red Cross and Doctors without Borders, and get this: both West Canadian and Blurb are matching the dollar amount of the proceeds raised up to $10,000. And of course until February 12th, the Canadian government will match that. If you do the math, it’s a pretty great deal in terms of raising money for Haiti, and you get a spanking new cookbook in the mail to boot. Chef Michael Smith, Dana McCauley, Emily Richards, Catharine from Weelicious, Cheryl from Backseat Gourmet, Jeannette of Everybody Likes Sandwiches, Nishta from Blue Jean Gourmet, Lauren of Celiac Teen, Charmian from Christie's Corner, Shaina from Food for my Family, Marisa of Food in Jars, Shauna and Danny from Gluten-Free Girl and the Chef, Lauren from Healthy Delicious, Alice from Savory Sweet Life, Tara from Seven Spoons, Jess of Sweet Amandine, Helen from Tartelette, Gail from The Pink Peppercorn, Pierre of Kitchen Scraps, Tim from Lottie and Doof, Tea from Tea & Cookies, Jamie from My Baking Addiction, Lori from Recipe Girl, Melissa from The Traveler's Lunchbox, Brooke of Tongue-n-Cheeky and Aimee of Under the High Chair. Really, looking at that lineup I can't believe we rounded up such a fabulous, generous and talented crew of people, all so eager to help. And the recipes? Fab. All with beautiful full-colour photographs. I'm still pinching myself. Soups and granolas and baking and preserves and curries and pastries and breakfast and ice cream and dinner ideas. And plenty of gluten-free recipes. We'll have two versions; a paperback and hardcover. As I type this, Cathryn is sitting beside me arranging photos and text and lining stuff up and all that designerly stuff. It's all just so thrilling and a little nervewracking as it comes to the point where it's time to actually sell books. I'm desperately hoping people aren't suffering from donor fatigue. So that's the status of Blog Aid as of Sunday night, coming to you live from my dining room table. Thanks everyone, for all you do. Keep an eye out. It's coming! I've enlisted the generous help of not one but two designers to collaborate on the project - one tackling the layout and putting all the copy and photos that are starting to trickle in into a print-ready format, and the other coming up with a look for the cover and Buy Now button. It's all pretty fantastic and coming together in what promises to be record time. As an offshoot - enough artists have contacted me, interested in donating their original artwork, that it looks like we're going to pull together a food-themed online art show in the coming weeks - watch out for that as well! And check out our ever-growing list of contributors to the right. Great people, all of them. We're busy gathering content and working on layout and design, so over the weekend this site will (hopefully) be transformed into something with the look and feel we're after for the project. Feel free to comment or contact any of the participating bloggers - and check back Monday for buttons on all participating blog sites that will enable you to purchase a copy of the cookbook, hot off the presses! Meanwhile, you can read more about the project here.